Soybean cyst nematodes (Heterodera glycines) have been an increasing problem for soybean producers over the past decade or more. H. glycines is the only cyst nematode known to attack soybeans in the U.S. Most of the major soybean producing areas of the U.S. now recognize that SCN is present in at least part of the area. SCN is and obligate parasite of higher plants, more than 1100 species of plants have been found to serve as hosts. Fortunately, most are weed and crop plants not commonly found in soybean fields or cropping rotations. Populations of the nematode increase rapidly under continuous soybeans, but decline drastically during the first year under non-host crops. Severe infestations of SCN can have a devastating effect on yields. Yield losses can range from slight to as much as 90% depending upon the degree of infestation, soil fertility, cultivar susceptibility, environmental conditions, and race of the nematode. Root systems of heavily infected plants are drastically reduced, necrotic and practically devoid of Rhizobium nodules. In Iowa, susceptible varieties yielded about 40 % less in infested fields than in non-infested fields. In Ohio on a fertile, dark colored soil, varieties resistant to SCN yielded over 50 bu/a, whereas those susceptible to SCN yielded from 24-39 bu/a (a yield loss of from 52% to 22%). Another study using aldicarb to control SCN found that high SCN populations may reduce yields by 30 bu/a. Soybean cyst nematode injury can be easily confused with other crop production problems such as nutrient deficiencies, injury from herbicides, soil compaction, or diseases. The extent of symptom development depends on several factors including the races of nematodes present and their population level, the soybean variety, soil texture, soil fertility, soil moisture, and tillage practices. Many fields infested with lower levels of SCN show no obvious damage on above-ground plant parts, other than lower yields. Where nematode populations are high, and environmental conditions are ideal, infected plants are severely stunted and chlorotic. Chlorosis is mainly due to N deficiency resulting from inhibition of Rhizobium nodule formation and the disruption of the flow of water and nutrients to the top of the plant. Infected plants may defoliate prematurely. The first field symptoms of SCN are usually detected in circular to oval patches of stunted, yellowed plants. Symptoms are most evident in late July or August when plants are under drought stress or in fields with low fertility. When populations of nematodes are high, the symptoms may even occur under normal to optimal growing conditions. Affected areas may increase each year, usually in the direction of tillage. Many times growers will not be able to detect any differences between affected and non-affected plants other than lower yields. Above-ground symptoms do not allow positive diagnosis of the problem, since such a diagnosis depends on examination of the root system for the nematode cysts. The cyst is highly resistant to adverse conditions and serves to protect the eggs and young nematode larvae for many years. Soil temperature and moisture are the most important factors determining the survival of the cyst nematode in the absence of a host plant. Larvae are capable of emerging from cysts exposed to -11°F. They may remain viable in the cysts for up to 50 days while exposed to temperatures as high as 104°F, while nematodes outside of the cyst will die in a few days at this temperature. Eggs in cysts are capable of remaining viable up to 8 yrs, in a moist soil at cool temperatures, but the survival period decreases as soil temperatures increase. Even in dry soil, some eggs may survive in cysts up to 7 years under cool conditions. Viability decreases more rapidly when dry soil is exposed to high temperatures or soil is flooded. Under favorable conditions, the larvae hatch from the eggs and search for a soybean root . The larvae can move through the soil only a few centimeters per year before entering a root, and if no root is found, the nematode dies shortly from lack of food. After penetrating a root, the nematode feeds on cells in the vascular tissue. It secretes digestive enzymes that stimulate the development of enlarged cell masses, called syncytia, that feed the nematode. Syncytia are a mass of fused cells, which are formed in the vascular cylinder in response to the nematode and severely disrupt the flow of water and nutrients to the top of the plant. During this immobile phase, the nematode molts three times before reaching adulthood, and after the fourth molt, becomes either female or male. Females are the cysts attached to the roots; their bodies swell and break through the root surface. The swollen, lemon-shaped body is white at first, then it turns yellow and brown in a few days. Males, on the other hand, remain slender or worm-like, and are mobile. The adult male moves out of the root and mates with the female that has begun egg production, although mating is not required for egg production. A typical, healthy cyst may contain 200 to 500 eggs, however there are always some less well formed cysts that contain many less eggs. Before the female nematodes death, and the formation of the cyst, some eggs are deposited outside the body in a jelly-like mass. These begin to hatch in a few days, and may continue to hatch for the next several months, and up to a year. Those remaining in her dead body (the cyst) are protected from the elements and may hatch up to 8 years later. Generally, 50 percent of the eggs produced by a female hatch each year; thus, the population may drop significantly after several years if there are no susceptible hosts to infect. Eggs survive best under cool, moist conditions. Under moderate soil temperatures (70-80°F) the life-cycle can be completed in 21 to 24 days. It is possible, therefore, to have three to five generations each growing season. Under favorable conditions, the SCN population in a field can increase by 20 times, or more, in a single season. In other words, a field can go from having no problem, to having a severe problem in a single season. Soybean cyst nematodes have been separated into "Races". At this time there are 16 listed races. Race is significant because each variety of SCN resistant soybeans has resistance to certain races, or groups of races. In any particular field, the population of SCN exists as a mixture of races, all of which can reproduce on susceptible varieties, but only a portion of which can reproduce on certain resistant varieties. All resistant varieties derive their resistance from three primary sources: Peking, PI 88788, and PI 90763. Another resistant line, Pickett, a selection from Peking, contains only some of the resistant genes of Peking. Races in SCN are not well defined; however, by monitoring how well a nematode reproduces on a given set of soybean varieties, called host differentials, the nematode can be classified as representing a specific race. At this time, SCN race determination is a biological assay procedure. The laboratory must grow various soybean varieties in soil inoculated with the SCN from the subject field, then measure the SCN reproduction that has occurred. This is a very labor intensive and time consuming process. Most commercial laboratories have chosen not to offer the service due to the requirement of an operating greenhouse and the resulting high costs. Soybean cyst nematodes can infect and survive on plants other than soybeans. The following is a list of crops and weeds that can be a host to SCN. SCN live on and in the living soybean roots, so we need to sample the soil that contains, or used to contain living soybean roots. If wide-row soybeans were planted, pull samples from within the rows. If the field had "solid-seeded" beans, the entire field was the root zone. SCN requires living plants to survive and reproduce. Severe infestations may result in dead soybeans in the center of the affected area. Dead plants do not support SCN populations, therefore the SCN population could be lower where plants died early. In these cases, the samples should be taken from the margins of the affected area, where the soybeans did not die. Where samples are to be taken uniformly across a suspect area of a field, walk the area in a zig-zag pattern and pull 15 cores from the present, or past root zone of the crop. Where you have an area of severe plant damage, samples should be taken from the margin of that area, walk the perimeter of the area (Figure 2), pulling alternate samples from a few feet inside the affected area, and a few feet outside of the area. In either case, the individual cores should be thoroughly broken down and mixed in a bucket, and a "very full" soil bag sent to the lab. This test requires 100cc (about 1 cup) of soil for each test. The lab should have at least 2 cups (200cc) of soil in order to make a second test, if needed. If you are taking samples from a field where a crop other than soybeans was grown in the previous season, and have no affected area present, then take the samples from an area no larger than 5 acres. Walk the area in a zig-zag pattern, as you would for a nutrient soil test. Pull 15 cores and thoroughly mix them in the bucket before putting the soil in the soil bag. Again, send a "very full" bag of soil to the lab for analysis. Where the previous crop was either SCN resistant soybeans, or a non-host crop, the field can be sampled in the fall or spring. Where the previous crop was SCN susceptible soybeans, a spring soil sample will provide a more accurate count of the nematodes present to infect the upcoming crop. There is a low, risk of economic damage to SCN susceptible varieties. However, economic damage may occur. Under favorable growing conditions, SCN populations are likely to increase, and possibly dramatically, if a susceptible variety is planted. This could lead to a high risk for a subsequent soybean crop. There is a moderate risk of economic damage to SCN susceptible varieties. Plant a non-host crop, or an SCN resistant variety next season. Re-sample the field before planting a susceptible variety. 5 - 7 Recommendation: Plant a non-host crop next season. In the following season, plant either a non-host crop, or an SCN resistant variety. Re-sample the field before planting a susceptible variety in the following season. 8 - 19 Recommendation: Plant a non-host crop next season, then re-sample before planting an SCN resistant variety in the following season. It may take 2 or more years of a non-host crop to reduce SCN populations below 3 cysts/100cc of soil. Plant a non-host crop next season, then re-sample before planting an SCN resistant variety in the following season. It will likely take at least 3 years of a non-host crop to reduce SCN populations below 3 cysts/100cc of soil. When SCN is detected in an area, control procedures should be instituted immediately. By waiting until symptoms of nematode damage appear over a large portion of the field, the buildup and spread of SCN is insured, and the effectiveness of control techniques is correspondingly reduced. No single method will completely control SCN once it is introduced into the field. Methods of control are aimed at reducing nematode populations sufficiently to reduce yield losses. In most cases, a combination of control practices will be required to reduce losses from SCN damage. This is the first line of defense. Nematodes can move no more than a few inches per year in soil by their own effort. Introduction into fields is usually by movement of infested soil on tillage, planting or harvesting machinery, or in soil on crop transplants. However, anything that moves soil will transport the nematode; clean machinery thoroughly with steam, hot water, or dry heat before moving from infested fields to non-infested fields, and plant only seeds that have been thoroughly cleaned to remove soil particles, or obtain seed from non-SCN locations. SCN can also be inadvertently introduced into a field by wind-blown dust, animals, or flooding. Rotating soybeans with non-host crops may be the most effective method of controlling SCN. In fields where SCN populations are high to very high (> 15 cysts/100 cc soil), grow at least three years of non-host crops between soybean crops. The nematode will not reproduce on non-host crops, and so the population will be reduced to levels where excessive yield loses are rare. It should be noted that the nematode will not be eliminated in these fields. If soybeans are repeatedly planted for several years, SCN again will become yield limiting. The nematode can reproduce on many legume crops (dry bean, hairy vetch, clovers), other crops (canola) and many weeds (henbit, common mullen, wild mustard, chickweed, pokeweed). Therefore, for the rotation to work, excellent weed control is vital. In fields with lower populations of SCN (< 500 eggs + larvae/100cc soil), two years' rotation away from soybeans or a rotation including resistant soybean varieties may be successful. SCN resistant varieties are available. These varieties reduce the ability of SCN to reproduce, and are able to produce acceptable yields in the presence of active SCN. developed using the black-seeded line Peking or PI 88788. Varieties with Peking-type resistance are effective in reducing populations of races 1, 3, and 5, whereas those with PI88788 type resistance are effective against race 3 (see Table 1). Varieties with resistance derived from one source (i.e., PI 88788) should not be grown continuously in the same field. Eventually, varieties with that particular source of resistance will become ineffective in reducing yield losses in that field. Also, resistant varieties should not be planted in fields with high numbers of nematodes. In all likelihood, heavily infested fields will contain nematodes capable of attacking that variety, in sufficient number to cause economic yield losses and increase overall nematode populations by the end of the season. A list of varieties with resistance to SCN should be available from seed companies, and each State Extension office. While there are some chemicals registered as nematicides, University data has not shown them to be more effective in controlling SCN than using SCN resistant varieties, and rotating to non-host crops. 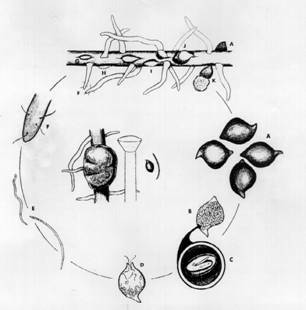 THE SOYBEAN CYST NEMATODE PROBLEM, Report on Plant Diseases 501, 1980, Dept. of Plant Pathology, Univ. of Illinois. SOYBEAN CYST NEMATODE, Extension Fact Sheet AC-39-94, The Ohio State Univ.